What is Pain and What Are Key Pain Management Strategies? It’s been a while since I’ve had something new to add to the blog about Fibromyalgia or Chronic Pain. I don’t write “for the sake of it”. However, recently I had an introductory session with my local Pain Management Clinic. So I thought it would be good to pass on what they gave to me. Although I knew most of what they shared, it was helpful and helps answer the questions of What is Pain? and what are the key pain management strategies? So I hope it helps someone out there – and if you have anything to add, please add these into the comments! This post may be “bitty” as it’s based on notes, so apologies in advance for over-use of bullet points. What Is Pain / Chronic Pain and how does it affect you? Chronic Pain affects 40% of adults in the UK. 40%. That’s bonkers, but lets you know that you’re not alone in your fight against pain. Pain is a natural response. You need pain as a self-preservation method. However “felt pain” changes person-to-person based on past experiences, our beliefs about pain and culture’s perspective. If you view pain as something negative, you may feel it differently to someone who views it in a more positive light. That means a person’s mindset and character can adversely or positively affect the level of pain felt. Emotions play a huge role in pain levels experienced: fear, anxiety, stress, depression can all make your pain worse – or at least make how much pain you think you’re in worse. Long-term (which is what “Chronic” means) pain can really affect chemicals in brain, which in turn affects your behaviour. For people with conditions like Fibromyalgia, pain experienced does not equal the damage present. One specialist in my past likened it to someone playing music on volume 2 out of 10, but you hearing it like it’s volume 7 or 8 out of 10. We feel more pain than the body is actually undergoing. Disturbingly, 30% of pain sufferers may not have a diagnosis. The reason this is the case is that you can’t always understand why someone’s in pain. That doesn’t deny the fact that a person is experiencing pain. However, as pain is derived from the nervous system (which spans all the human body), the source of pain can be really hard to track down. Normal X-Ray and MRI Scans can find something that needs treating, equally these scans may come back “normal”. In the past I have had both MRI Scans and X-Rays and I got a letter back to say “We are pleased to let you know your scan results came back normal!”. I wasn’t pleased at all – at the time I needed a diagnosis. My Fibromyalgia diagnosis came in abou 3-5 years after these scans! In adults, healing is a repair process, as opposed to “new for old”. Apparently the body stops replacing damaged tissue after the age of 17. Reparations take time, so there are no quick solutions in Chronic Pain patients. Having bad movements (how you transport yourself) or posture can make it worse. In my case, carrying something (anything) hurts more, walking too quickly does too. The same applies to being in one position for too long. I try to get up every 1½-2 hours for 5-10 minutes. The problem with Chronic Pain (and the accompanying Chronic Fatigue) is having the energy to move! Equally I can’t spend too long in bed, however tired I am, because it makes my neck, shoulders and back pain worse. While not moving is bad, so is doing too much, which is why my Doctor has advised me not to work until we know what my body is actually doing. Chronic Pain adversely affects everything – work, hobbies, family life, social life. This is why I have to vary my gaming, or delay writing blog posts. These things fall into the “fun” category, but Chronic Pain can even make “fun” an endurance test. Inflammatory Pain: A localized reaction that produces redness, warmth, swelling, and pain as a result of infection, irritation, or injury (More Info). Central Pain: a dysfunction that specifically affects the central nervous system (CNS), which includes the brain, brainstem, and spinal cord. (More Info). This kind of pain can occur after some form of brain damage – e.g. after a stroke. Medically Unexplained: including some wide-spread pain conditions. Yes, this is a category of pain! It doesn’t deny the pain’s existence, but makes carving a treatment out harder. Usually, with Chronic Pain, there is no point doing MRI Scans, blood tests, X-Rays or Ultrasound Scans. What are the Key Pain Management Strategies? The Pain Management Clinic were quick to stress that they are not a curing service. I already knew this, but some attendees may have had misconceptions. There is no actual cure for Fibromyalgia. The focus is actually on finding a long-term strategy in place for managing the pain instead. Once you’ve answered the question of What is Pain? you then have to move onto How do I manage the pain?. This is where the Clinic aims to help. All pain drugs are designed for short term. This is the case, despite the fact that many of us have been on medication for years and years. But they weren’t originally developed for long-term use. It is becoming harder to get opioid meds for chronic pain. This is an issue I won’t be blogging about, because some Fibromyalgia sufferers do get benefit from them, and some, like myself, do not (and I don’t want that argument starting on my blog!). But more recent studies have shown they should have a neglible impact on felt pain. And my doctor thought that my opiods might be contributing to my Chronic Fatigue symptoms, which may well be true. Opiods are designed as “unnatural endorphins“. Producing more naturally is better. Opiods can make pain worse if there are not enough pain receptors for the amount of medication being taken in. On top of that opiods can cause aggression or increase in depression symptoms. The aim of using medication for Fibromyalgia is a 50% reduction in pain, but 30% is deemed to be “good”. How they measure that I’m not sure as everyone’s experienced pain is different. The main issue with using medication is increased tolerance, meaning a need to go up the scale of strength of medication as your body gets used to lower grade ones. Dependency can lead to anxiety when trying to reduce medication, which can lead to more pain. Having injections for pain is rare but can be provided when appropriate. Only a small proportion of people will benefit from these. Injections are a short term option only. Other pain management strategies are needed for the medium and long term. Pacing Yourself: not over-doing it. What do you do on a “good day”? Does it lead to more bad days? So don’t push yourself to do too much on a good day else it’ll come back to bite you. If you don’t pace yourself pain will control you not vice versa. Prioritise: Chronic Pain patients tend to be more perfectionist (which definitely describes me), but that adds self-pressure and can blur priorities. Exercise: the purpose here is to produce your own, natural endorphins. See the section below. Exercise doesn’t mean going to the gym, or even the swimming pool. For that reason the Pain Management Clinic refer to “exercise” and “activity” meaning the same thing. A 5-Minute walk around the block is exercise. Exercise reduces stress, which in turn reduces pain. Keep supple and flexible, tone muscles. Gentle stretches even can help with this. More vigorous are things like Tai Chi or Pilates. Exercise helps control weight, putting less pressure and strain on your muscles and joints. Activity improves heart and lung function (increased Oxygen Flow can help with lowering pain too. It improves sensory and motor functions in the brain. Given that pain originates through the brain via the nervous system, improving brain function is good. If picking up exercise from scratch start with 5 minutes a few times/day then increase it slowly. Aim: 2½hrs activity a week. Don’t do too much too soon and don’t pick an activity you don’t want to do. What Have I Been Doing to Date? Apart from medication, I haven’t been doing a lot recently. I’m not overeating, so I don’t need to lose weight. If anything I’ve not been eating enough because getting up to get food is tiring. In the last couple of months I’ve been getting up from my computer every 1½-2 hours for 5-10 minutes. This helps the ‘not sitting in one position for too long’. From today I am aiming to walk around outside for that time, measuring the steps I take. At least before I end up in Pain Management I should be showing some willing. 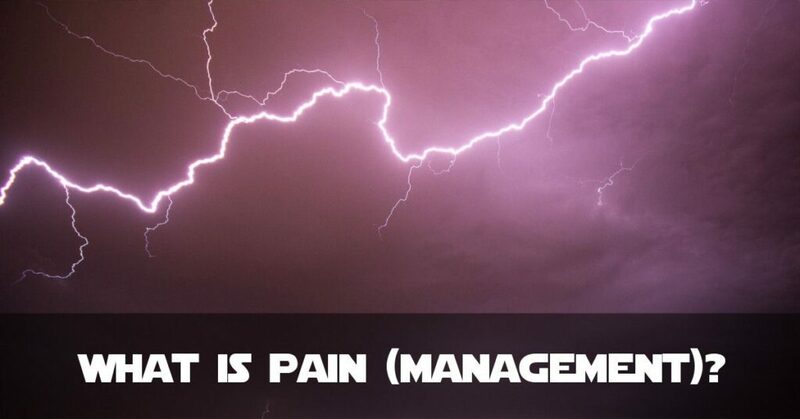 TL;DR What is Pain and Pain Management? Pain, specifically “felt pain” is so complex it varies person-to-person. Although pain is a natural response to stimuli, identifying the ultimate cause can be difficult – and sometimes impossible. The effectiveness of medication in the case of Chronic Pain is deemed debatable (at least for now…medical ‘facts’ change over time!). The way pain management seems to be developing is to focus on the whole person – the “holistic approach”. This means looking at working arrangements, obligations, home life, and lifestyle. So although the question ‘What is Pain?’ is simple, sorting out your pain management plan will be much more complicated! And if the aim of a successful pain management course is a reduction of 30-50%, then to be honest, I’d take it. The levels of pain have only been increasing this year and especially so in the last 1-2 months, so any reduction right now would be welcome.